A tropical forest is easy to cut down, but getting it back is another story. In a special issue of the journal Forest Ecology and Management, leading researchers at the Smithsonian in Panama and across Latin America offer new insights on reforestation based on 20 years of research. "Twenty years ago, we had almost no information about how to build a forest," said Jefferson Hall, staff scientist at the Smithsonian and lead editor of the new special issue of Forest Ecology and Management. "People either planted one of four non-native speciesteak, pine, eucalyptus or acaciaor they used a trial-and-error process with other species that was not always successful. Now we can be smart about which trees we plant at a given site, and we understand much more about what motivates land owners and rural farmers to put this know-how to work." Forests keep water clean, control soil erosion, store carbon, shelter animals and provide plants that offer pharmacological benefits. Forests also contribute to global-scale economic activity in the form of ecosystem services. The Agua Salud project in the Panama Canal watershed, funded by the HSBC Climate Partnership and featured in the special issue, is a 700-hectare experiment that examines the ecosystem services forests provide: water for people and the Canal, carbon storage to mitigate global warming and biodiversity protection in one of the crucial biological corridors between North and South America. "Native tropical forests are some of the richest storehouses on earth," said Eldredge Bermingham, director of the Smithsonian Tropical Research Institute. "Now the science behind tropical forest restoration is at a level of sophistication that reforestation projects can be planned to target multiple goalsto store carbon, manage water and conserve biodiversity, buffer old-growth forests from destruction and provide a strong return on investment." Managing forests for ecosystem services requires tradeoffs. A hectare of teak stores as much carbon as a native forest after 20 years, but will shelter far less biodiversity. In the Agua Salud experiment researchers plant mixtures of native species. Their data predict that some mixtures will surpass the carbon-storage capability of teak and the ability to support other plants and animals. Plantation soils in one experiment lost a huge amount of carbon in less than 10 years. Another experiment not far away showed soil-carbon levels under similarly aged secondary forest did not change. This juxtaposition suggests that while secondary forests may not store as much aboveground carbon as carefully tended plantations, they do a better job of maintaining soil carbon stocks. The information highlights potential tradeoffs in ecosystem services with land management and points the way to the next generation of ecosystem service research. Scientific information to guide reforestation is especially necessary in a world where half of the tropical forests are secondary forests growing on abandoned farm and pasture land. 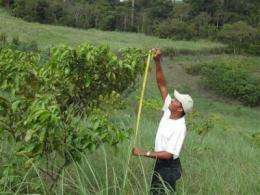 The special issue summarizes results from more than 60 tree species grown in Panama at sites with different rainfall and soil types. Native trees often grow well in forest-restoration projects because they are adapted to local conditions. Amarillo (Terminalia amazonia), a tree species native to Panama and neighboring countries, grows as well or better than teak on degraded agricultural soils in wet areas yet is sold for the same value as teak in timber markets. Cocobolo (Dalbergia retusa), a highly valuable wood, grows particularly well in relation to other species on dry sites with relatively infertile soils. Several articles provide guidelines for land managers as they weigh environmental and economic factors in their decision making. In Latin America there is a critical mass of information available to begin recreating forested landscapes intelligently.